USS Wichita (CA-45) was a unique heavy cruiser of the United States Navy built in the 1930s. The last American cruiser designed to meet the limits of London Naval Treaty, she was originally intended to be a New Orleans-class heavy cruiser, accordingly with the maximum main armament of three triple 8-inch (203 mm) gun turrets. These were instead placed on an improved hull derived from the Brooklyn-class light cruisers, with increased armouring. This design would go on to form the basis for the later World War II-era heavy cruisers such as the Baltimore-class cruisers. The ship was authorized by the 1929 Cruiser Act, laid down at the Philadelphia Naval Shipyard in October 1935, launched in November 1937, and commissioned into the US Navy in February 1939. Following her commissioning, Wichita was assigned to neutrality patrols in the Atlantic. After the United States entered World War II, the ship saw heavy service throughout the conflict. Wichita was heavily engaged during the invasion of Okinawa, where she provided heavy gunfire support to ground troops ashore. After the Japanese surrender, the ship served as part of the occupation force in Japan and assisted in the repatriation of American military personnel under Operation Magic Carpet. After returning to the United States, she was decommissioned and placed in the mothball fleet in 1946. She remained in reserve until 1959, when she was stricken from the Naval Vessel Register and sold for scrapping in August 1959. 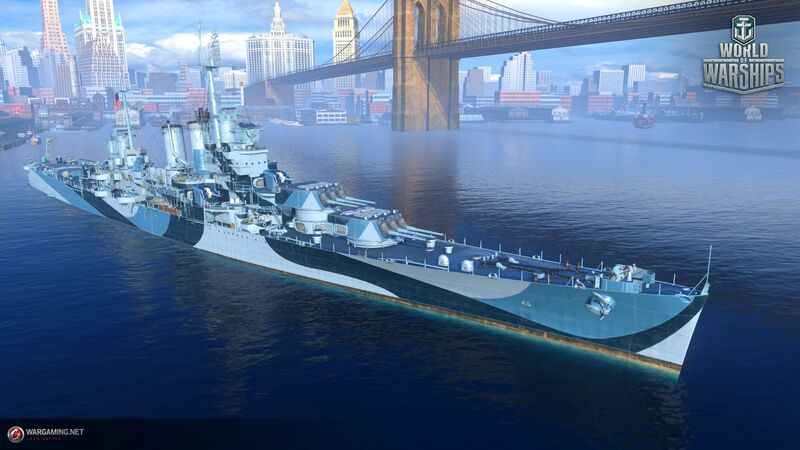 USS Wichita will be introduced as a Tier VIII Premium heavy cruiser under the American tech tree. More details as soon as they are available. AA Defense 4×4 40.0 mm, range – 3.5 km, damage per second – 64. 4×2 40.0 mm, range – 3.5 km, damage per second – 45. 18×1 20.0 mm, range – 2.0 km, damage per second – 65. 8×1 127.0 mm, range – 5.0 km, damage per second – 86.
how many tierVIII US Battleships ??? Its not a BB its a heavy cruiser.